This is the second in a series of simple exercises you can do to improve your trigger control. These exercises will help you become more aware of your trigger finger and better able to control its motions. No matter how fast you can draw or how dynamically you can move, you will not be prepared to defend yourself with a firearm until you can hit your target reliably. You cannot hit your target reliably until you develop good trigger control, and that’s what this series is about. Start with an empty firearm within the confines of your safe dry fire routine. Check to be sure it is really empty, then choose a safe direction. Because human beings are not robots, you will see that perfection eludes you. No matter how carefully you hold the gun, your front sight will always have a slight tremble or wobble in it. This is normal and not a cause for concern. The wobble tends to get stronger when you’re tired, when you’re under the influence of caffeine or other stimulants, and as you age. It gets very strong indeed when you have a lot of adrenaline in your system, such as when you are excited or frightened. In other words, if you are practicing for self-defense, you need to become very familiar with your wobble, because we know it will be there if you use the gun to defend yourself. Fortunately, even a severe wobble really doesn’t matter at all — as long as you know what to do about it. Before we go any further, let’s try one more thing. With your sights aligned carefully on the target, press the trigger just as slowly and just as carefully as you did in the first exercise. Watch the front sight as you gently, smoothly, bring the trigger all the way to the rear. How motionless can you hold the front sight while you bring the trigger to its break point? Can you keep it from moving even a tiny little bit? As you press the trigger, you will see a slight wobble – the same size and type of wobble you noticed while you were simply holding the gun on target. That’s okay. However, you might see some additional movement, with the front sight moving abruptly or dropping dramatically just before the trigger ‘clicks.’ That’s not okay. When I talk about accepting the wobble, I am talking about accepting the first type of movement, that slight tremor in the sights. I am not talking about accepting the second type of movement, the one that allows your front sight to take a dive just as you finish pressing the trigger. Fortunately, it isn’t hard to learn how to deal with the wobble. First, let’s talk about what doesn’t work, and why. Many people yank the trigger back suddenly during a brief moment when they see the front sight wobble into perfect alignment with the target. This doesn’t work well because it often sends the shot low. A right-handed shooter with this habit tends to produce targets with a lot of shots that hit low and to the left, while a left-hander doing the same thing makes her shots hit low and to the right. When a shooter has this habit, she’ll often produce a target that has a “fanning” effect, making a pattern like a pizza slice fanning out toward the bottom left (or bottom right) of her target. 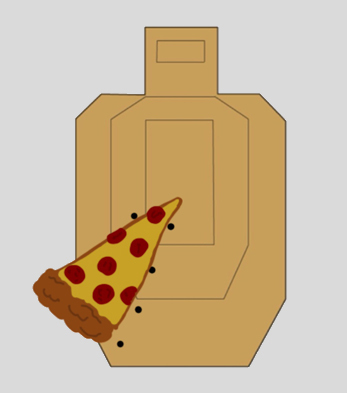 To avoid seeing that slice of pizza on your target, try this instead. Accept the wobble without fighting! Simply keep realigning the sights while you press the trigger as smoothly as you can. As long as you press the trigger smoothly, the wobble does not matter at all. It’s just a benign natural artifact, and nothing to worry about.